Jason Schechterle was on duty in 2001 when his patrol was struck by a taxi and he was trapped inside. Now he's using that experience to encourage and motivate others. PHOENIX - March 26, 2001—the day a Phoenix police officer’s life took a tragic turn. Jason Schechterle’s patrol car was rear-ended by a taxi and burst into flames, leaving him with severe burns. But now he's using that experience to encourage others. 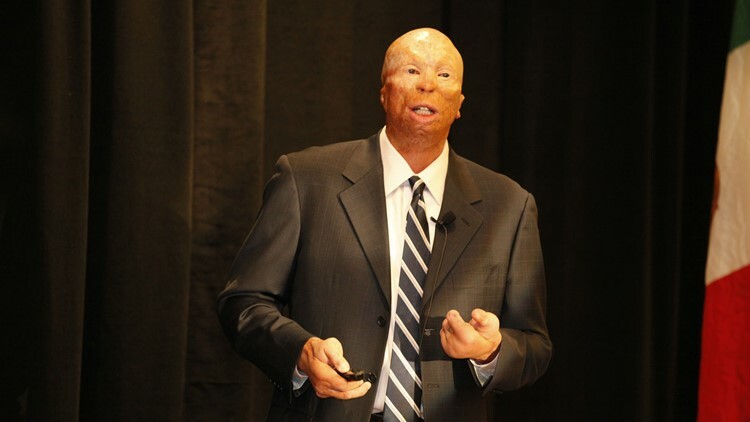 Schechterle recently shared powerful words during a motivational talk in Phoenix. “When my accident happened in March of ’01, there were so many days I never thought I’d even survive,” he said. Schechterle will remember the day his life changed forever. He was on duty and his patrol car was struck by a taxi traveling at more than 100 miles per hour from behind. His car burst into flames, trapping him inside. “There were days I didn’t know how I’d overcome. I was blind. I had such a drastic change to my appearance, with my scars and everything,” he said. The medical teams at MIHS and the Arizona Burn Center helped save his life. But as time has gone by, his story has evolved. “My health and happiness continues to get better,” he said, at a motivational talk for folks with Serenity Hospice and Palliative Care. “At first, of course, I think people get caught up in my appearance or they tend to think about what I’m going to tell them, like being involved in a bad fire. And I like to encourage people to stay in their own shoes and think we’re all… everybody has a story,” he said. Inspiring others is his passion. “I’ve had such an incredible life,” he said. When Schechterle was injured in the line of duty, the support he received from the community was priceless. Schechterle spoke words of encouragement, leaving the audience feeling positive and motivated. “Life really is 10 percent what happens to you and it’s 90 percent how you react to it. And a little bit of perspective goes a long way for all of us,” he said. Schechterle has undergone more than 50 surgeries, but now, thankfully, those days are over. His focus is clear: enjoying his family and traveling around the country telling his story of survival, which he also shares in his book “Burning Shield”. Schechterle continues to help others through his foundation as well. It’s called Beyond the Flames.